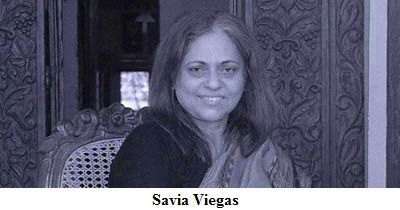 Savia Viegas, the accidental artist, for whom painting has been an escape, a respite from the pressures and routine of life, brings us a collection of vibrant paintings under the title of Mementos. As an academic she has had an enviable career, having graduated from Elphinstone College, received a PhD in Satavahana Sculptural Art from the University of Mumbai and awarded the Senior Fulbright Fellowship (2003-2004), which earned her a residency at George Washington University and the Smithsonion. She is also the author of Tales from the Attic, Let me tell you about Quinta, Abha Nama and Eddi and Diddi. The latter two are graphic fiction works and a testament to the balanced integration of her pictorial depiction and her textual narrative. The lack of training in fine arts has been advantageous rather than a hindrance as it allows her free flowing expression and innovations in her paintings. Savia says, ‘I paint images I cannot express textually.’ She alternates between writing and painting, setting aside one for the other if either prove to be too constricting. This provides the opportunity for a fresh allowance of ideas. Her fascination with paint, and mixing and playing with colours, has stood her in good stead in giving her the freedom to produce her own illustrations. She need not depend on having to explain her thoughts to any other artist who may or may not be able to capture the visual experience of her words. Savia has spent a large part of her life away from her native village of Carmona, Goa, studying and working in Mumbai and the US. She maintains her abhorrence for all things Goan had become an integral part of her psyche. She says, ‘My mind was an opaque river in which I was dunking all the images that had Goaness in them.’ She disdained the narrow identity that the nomenclature of ‘Goan’ bestowed on her. However, on her return to her old Zonkar roots, she says, ‘I understood all things Goan instinctively and began to dredge up the images from the opaque river.’ Thus, the myriad pictures with their vitality and vivid colours testify to the veracity of her statement in telling stories of Goa. Savia Viegas did not start painting till she was forty-years-old. ‘I was doing my PhD and was looking for things to do that would give me some rest from my work. I began writing my first novel Tales from the Attic and around the same time I inherited a house,’ she tells us. The house was in need of repairs and when she went to investigate the premises she chanced upon a cement sheet which somehow aroused her creative instincts. The cement sheet became her canvas for colourful experimentation and eventually the result was the much appreciated cover of her first book. Later, in 2009, she had her first solo exhibition Picturing Us. Her academic training in Indian culture, her tenure teaching Indian Art History at a college affiliated to the University of Mumbai and her fascination with artists such as Arpita Singh, Bhupen Khalkar, Ghulam Shaikh and some African artists, is evident in her paintings. She has also been influenced by Pahadi paintings, Mughal miniatures, and Buddhist paintings and sculptures that tell a story in every instance. The paintings tell stories of Goa by drawing from various schools of art, resulting in a style she makes purely her own. The painting Girl Child Saga I is a representation of the desire to appropriate symbolic power. As Pierre Bourdieu suggests, the power of language lies in its ability to evoke signs and symbols. When these signs and symbols are given an artistic presence they become even more powerful. The painting shows a young girl who refuses to marry and the images in the background are those of figures of women in graduation caps and robes, the Virgin Mary, and a nun. They represent education and virtue, attributes that society esteems as power infusing tools. Savia deems these similar to Hitler’s power wielding gesture of the outstretched arm and Jayalalitha’s transformation from a film actress to the sari clad ‘Amma’. Images of Goa’s trials and tribulations, political turmoil, evolution of the gentry and flight of the Goans to greener pastures are plainly portrayed in her paintings. Savia does not believe is creating images without a message embedded in them. 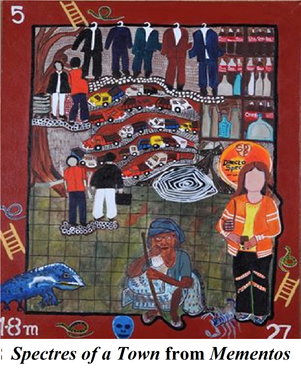 ‘My paintings always have social, political and economic themes. This is probably because I’ve grown up as a political person,’ she says. Antonio Viegas, her uncle, was involved in the freedom struggle and politician Matanhy Saldanha was her cousin. Her family had strong political affiliations and there were perpetually discussions on these lines. Moreover her work with political groups as a student at Elphinstone College made her mature faster. She explains, ‘I’ve worked in the slums of Dharavi and seen things at gut level.’ She has written scripts and worked with these people on a cultural plane. Her training as a historian has also contributed to the temperament of her artistic expression. At the end of the day, for Savia, it is about enjoying painting, and more satisfaction is derived when the journey is meaningful and significant: when the exercise of painting is lent the value of stimulating thought processes and constructive change.